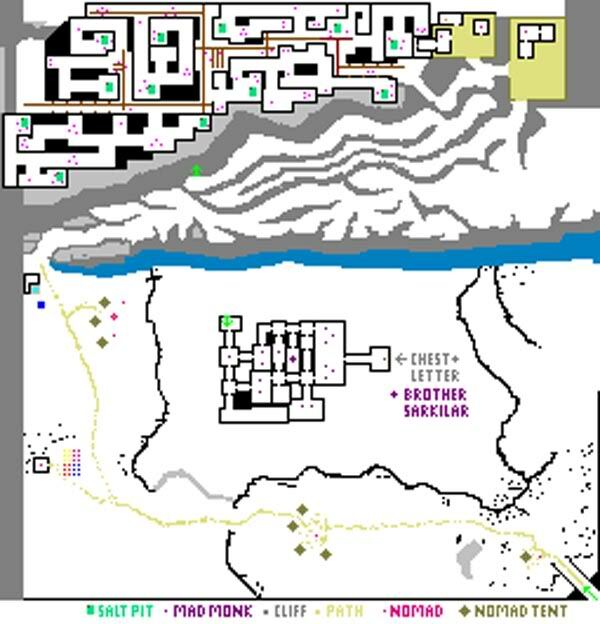 Enter from NW of Bone Tower in Exkordon arriving at S corner of Nomad Plain where you meet Kalanur 229,236 of the Vana Kiru tribe who will tell you the ways of the Nomads. The Nomad Tribes here do not have any use for money, They trade in salt and wolf pelts. Tribe membership is required for trading and gambling (his max bet is 200 salt), and costs 100 salt He will trade with you without tribe membership for wolf pelts until you have enough salt to buy tribe membership from him. When you go NW you will encounter a Harpie, with a really wicked warcry. Once you get into the mountains at top of map you will find many harpies who can warcry 2-3 times. 204,11 Kir Garan Teaches Life in exchange for a gold statue of Kir, buy one from Lorkam. Cave Entrance � at 83,74 teleports you to building entrance � on central plain with evil monk (Lvl 73) with FB and a nasty Freeze. Do not attempt this without a FB reflect ring. Make your way to Brother Sarkilar and kill him, get key and dice from corpse. Then go to chest and get letter and return to monastery and give letter to Kir Laas. It is easier to recall out of the chest room than to fight your way out.